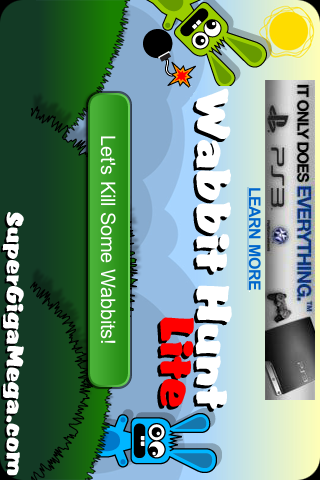 Wabbit Hunt Lite is a "Whack-a-Mole" style game with a rabbit hunting twist. Tap the rabbits to "shoot" them without tapping on the zombie rabbits or getting blown up by the rabbits with bombs. Your game is over after dying 3 times. Now with sounds and vibrate! The paid version of this app is available on the Official Palm App Catalog (Link for Pre to App Catalog). This version of the application has also been submitted to the Official Palm App Catalog as a free version. The free version will be submitted to PreCentral when it is submitted to Palm so new versions will likely be available on PreCentral sooner than the App Catalog. Wabbit Hunt Lite is replacing the listing for Wabbit Hunt to be in line with the name in App Catalog for the free version.